Recently in the wake of #ChennaiFloods, we got to see lot of information about the disaster, the relief work etc. But there was a new interesting angle to the information… lot of people took efforts to stress the point that how a Hindu was helping a Muslim or a Muslim helped a Christian. 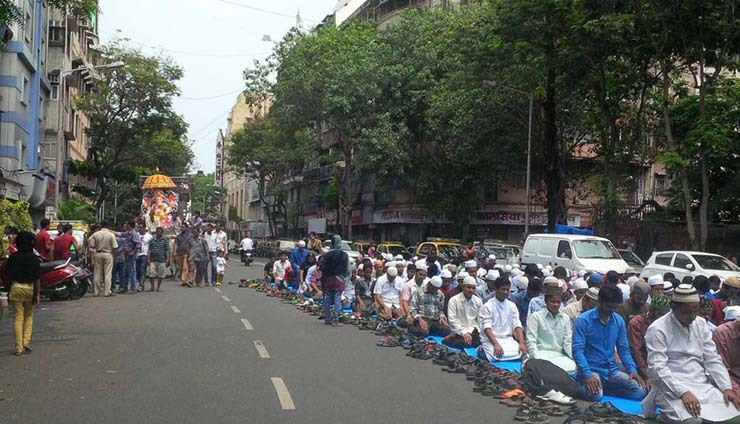 For that matter photos testifying religious harmony – like Muslims doing Namaz on street and giving way to Ganesha procession – have started making rounds only in recent times. One is expected to feel reassured with such pictures – but there is more to the story. We Indians are brought up with certain social values. We are told to be humble and not to be outspoken about our virtues. That’s why western concepts like “Mothers’ day” or “Fathers’ day” could not catch hold India. Imagine a movie scene where Amitabh Bachchan would give a Mothers day card to Nirupa Roy saying “… to the best mom in the world” or in some Rajashree movie Reema Lagu saying to Alok Nath “… thanks for 25 years of togetherness, my beloved!” … it will sound phony. We always like the obvious things to be unspoken! That’s why suddenly sharing photos of religious harmony in the wake of natural calamity somewhere looks odd to me. We did not mix relief and religion in case of earlier floods, tsunamis or earthquakes. Then why now? It’s the agony of a common Indian – inherantly secular and tolerant at heart – who is disturbed with the intolerance news and is trying to reassure himself and others. Its’ kinda cute here that… people irrespective of their ideologies and beliefs are sharing this, but trying his sincere best to stick to his viewpoints. 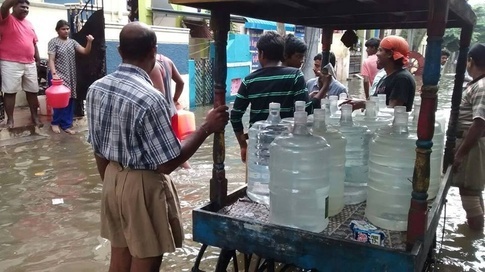 A Bhakt or Sanghi is sharing the relief work of RSS for Hindus as well as non-Hindus (“take that Commie!”)… while an AAPtard or Commie is sharing photos of people getting shelter in Mosques, ascertaining the Idea of India (“take that, you Sanghi bigot!”). But the point is same, only perspective differs. This is like standing at the ‘Sangam’ of two rivers and arguing which river is meeting the other! Final and perhaps the most important point… is about defining the word ‘news’ in the new age. By definition media brings us daily information, which we call as news. It was traditionally done by print media and in last couple of decades by electronic media. But all along we have always treated ‘news’ and ‘facts’ synonymous. In today’s world news is a TRP driven business with cut-throat competition and hard quarterly goals. It was a business in days of Print media too, but then the readers were paying for the news. As far as electronic media is concerned, someone else pays for the news that we get for free on our television. This is a crucial difference! Every business is loyal to those who pay for it.. since we do not ‘pay’ for news, we do not have any ‘say’ in the news. That’s why Electronic-media is so vulnerable to paid news. As viewers we need to understand that ‘news’ may not be same as ‘facts’ anymore! The best example of this came a couple of months ago, where there was sentimental ‘news’ about Yakub Memon’s funeral, while in ‘fact’ everybody’s Facebook walls were flooded with emotional tributes to Dr. APJ Abdul Kalam. The present attempts by individuals to share the stories of communal harmony in India is the response to the ‘news’ (artificially created sentiments) than ‘facts’. To look for the facts, we can just look at simple things around ourselves! Don’t we all have friends in our Facebook list who belong to the ‘other’ religions? How many times did it remind you that he/she is from the ‘other’ religion in the wake of recent ‘intolerance’ fairy tales? In normal, day-to-day life, I have remembered a person’s religion when there comes Eid and I think of Sheer-khurma .. or when my friends brought cake in office on Christmas. In fact it is very common that you have known someone since a couple of years and one day you come to learn that he/she is from particular cast/religion and you are surprised – because his name is very common, he doesn’t wear any religious symbols, he eats-speaks-dresses like you! That’s precisely the Indian way of life. It is not scripted in the news rooms, its scripted by your and mine daily dealings. Congratulations! Your blog post was selected for Tangy Tuesday Picks edition on December 8, 2015 at BlogAdda. Well said Sandeep. You mirror my thoughts. The idiots who tweeted those images and their stooges – paid no doubt – who retweeted them, used relief hashtags that unnecessarily clogged vital relief streams. The fact that it is these idiotic bits of ‘news’ that gain faster traction over even a tragedy of this magnitude is an issue we all need to introspect upon. Nice article Snadip. Your idea about Being Indian is almost perfect. Now a days the social media and Electronic media (which we normally refer to NEWS) is creating a mountain of a molehill. As rightly stated our religion was never in front in all our lifes, it was friendship, groups, society which always took the identity. As a country we are one of the most complex in diversity and simple in fundamentals when it comes to religion. Good that we are showing our character again and it is seen by many on social network beside all the intolerant and funny planted (news) by the ELITE.